Ainethach is a Breton miner and the owner of Karthwasten and its two mines, Sanuarach Mine and Fenn's Gulch Mine. He has two adult children named Rondach and Voada who work in Understone Keep as the chef's assistants. As one of the few native Reachmen to own land in the Reach, Ainethach is frequently hassled by both the Forsworn and Nords of Markarth, who both accuse him of having a secret agenda against their respective groups. His mine also makes him a target for the machinations of Thonar Silver-Blood, the leader of the Reach's wealthiest and most influential family. 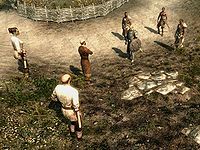 You will encounter him during one such time, as mercenaries hired by the Silver-Bloods, led by Atar, are trying to force him to sell the mine by shutting it down under the pretext of Forsworn activity nearby. You can either aid Ainethach by getting rid of the mercenaries or convince Ainethach to sell his mine to the Silver-Bloods. Upon raising his disposition, he will become a potential candidate for marriage. When you first enter Karthwasten, you will find Ainethach along with two of his miners, Ragnar and Lash gra-Dushnikh, having an argument with Atar and his fellow sellswords. After this event is over, he will resume his normal routine. Ainethach begins his day by waking up at 7am and leaving Karthwasten Hall to head outside. He will then spend the next 12 hours working on the exterior of his home, either using a hammer to repair the house or sweeping his balcony. He may also be found taking a break at the table or seated on one of the benches found outside his house. After spending all morning and afternoon outside, Ainethach will head inside his house at 7pm. He will spend the next 5 hours relaxing inside his home, until he goes to sleep at midnight. Ainethach wears a set of fine clothes and matching boots. He is equipped with a steel dagger and carries a key to Karthwasten Hall and a selection of upper-class items and gold. 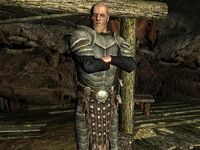 Ainethach will be quick to discuss his issues with the mine if you talk to him: "If the Forsworn aren't attacking my town, the Nords are trying to force me off it." He may also tell you about his unique position of being a landowner: "I'm one of the few native sons of the Reach that owns land. It doesn't make me very popular." You can ask him if he is in charge here, which will have him further elaborate on the issues he faces as a landowner: "My family has owned Karthwasten for generations. Rare for anyone in the Reach that isn't a Nord. Not that it does me any good. Nords think I'm working for the Forsworn. Forsworn think I'm working for the Nords." During The Heart of Dibella, if you tell him that you are looking for a young girl that lives around here, he will reply by directing you to Enmon: "Oh, my. You'll want to talk to Enmon about that." The citizens of Karthwasten will often mention Ainethach in conversation. Mena may direct you to Ainethach if you try to talk to her: "Ainethach's in charge of Karthwasten. You should bother him." Her husband Enmon will sometimes brush you off with a similar statement: "You should talk to Ainethach. He's in charge." Ragnar will often talk about his boss, saying: "I'm Ainethach's right-hand man. I help supervise the mines." 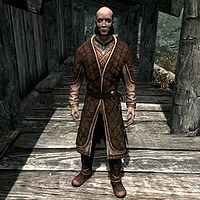 and "Not many Nords would work for a Reachman, but Ainethach is a good man." If Ainethach dies, Ragnar will question the future of Karthwasten: "Ainethach is dead. What will happen to Karthwasten now?" Lash will also comment on his death: "Ainethach's dead, but that doesn't mean we can stop working." "I want you sellswords out of my mine." What if I convince them to leave? "You can try, but I'd keep your sword-arm ready if things get ugly." After this conversation, you can ask Ainethach who the Silver-Bloods are, to which he will reply: "A family of thieves. Running their corrupt empire from Markarth. The Silver-Blood family own half the Reach, and they won't stop until they own all of it." If you told Ainethach that you will help convince the sellswords to leave, you must now head inside Sanuarach Mine and persuade Atar and his men to leave. Once you have used persuasion or force to clear the mine of the sellswords, you can return to Ainethach and tell him that the sellswords won't be a problem now. He will happily respond: "That won't be the last we hear from the Silver-Bloods, but at least we can get back to work. Thank you. You've done a good thing for me and my workers. Here. This is for you." He will then give you your reward, a leveled amount of gold. When you talk to him now, Ainethach may happily state: "Finally, both of my mines are open again. Time for everyone to get back to work." "We just want that old native to hand over his land in payment for our services." They won't stop until you do. (Persuade) Passed: "You're right. They always get what they want, somehow. Fine. Tell Atar I'll sell." Failed: "Someone has to stand up to them. I won't sell." Look. I'll give you a fair price. (Bribe) Passed: "That's more gold than they're offering. Fine. I'll sell." Failed: "This isn't about the money." You do or you get hurt. (Intimidate) Passed: "Easy. I'll sell. Just don't hurt anyone." Once you have persuaded him to sell the mine, you can return to Atar to tell him about your success. Atar will then proceed to give you your share of the cut, which is the same amount of leveled gold you receive if you help Ainethach. This page was last modified on 23 October 2018, at 10:41.